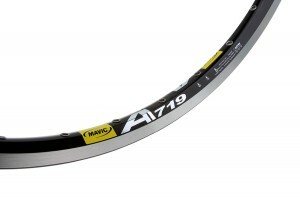 The Mavic A719 – I had to write about this rim; it’s bullet proof in my humble opinion. Last year I used this rim on the front of my bike to travel down tow paths, rough tracks with an extra 10kg of weight in the panniers. Now I’m not a sprite of a lad like Stovesy, so this wheel has to put up with a lot! Last year I had a metal post head on at 17mph and bent the metal post, cracked a rib got a lot of bruising, wrecked my rear mech hanger, rear dérailleur and front cog. It did wreck the Mavic rim, but it didn’t bend the wheel so that I couldn’t ride home!